Sakai Guides and DocumentationSakai Complete User Guide Sign-UpHow do I copy a meeting? Click on the meeting name to open the details, and then click the Copy link at the top. Make your changes, then click Publish New Meeting. Zoom: Make your changes, then click Publish New Meeting. You now have a display entitled Copy this meeting. 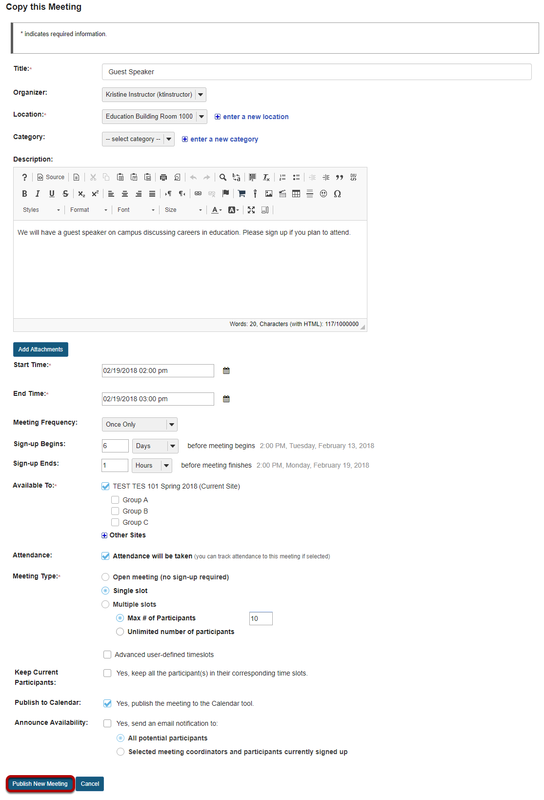 Change the settings as desired, including the title if you want a new meeting name, and then click Publish New Meeting. Prev: How do I lock or cancel a time slot? Next: How do students or participants sign-up for meetings?